I read this article and found it very interesting, thought it might be something for you. The article is called How Water Inequality Governs Drought-Hit Maharashtra and is located at https://archive.indiaspend.com/cover-story/how-water-inequality-governs-drought-hit-maharashtra-24377. 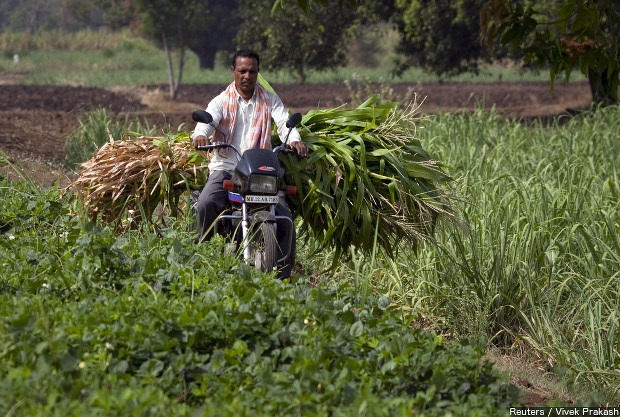 A farmer carries cut sugarcane on his motorcycle through a field outside Gove village in Satara district of Maharashtra. A resident of Pune, Maharashtra’s second-most developed city, uses five times as much water as her counterpart in Latur, the district most ravaged by drought in the south-central Marathwada region. That’s the extent of water inequality in Maharashtra, India’s most developed state, according to an IndiaSpend analysis of statewide water use, characterised by disproportionate availability and consumption of water across regions, crops and consumers. The coastal region of Konkan—occupying a tenth of the state’s landmass and home to 14% of its population (except Mumbai)—contains more than half of Maharashtra’s water, according to government data. The populous, dry and rain-shadow regions of western, central Maharashtra, Marathwada and Vidarbha, retain the other half, clashing with each other and neighbouring states for water. But the natural imbalance of water does not make drought inevitable. That happens because water has been deliberately routed to areas where it is already plentiful and to farmers who are politically powerful. Sugarcane—which is grown on 4% of the state’s farms—consumes 70% of water available for irrigation, IndiaSpend reported earlier, although no more than 1.1 million farmers grow the lucrative cash crop. In contrast, about 10 million jowar (sorghum), pulses and oilseeds farmers get no more than 10% of irrigation water. “The earlier Congress–Nationalist Congress Party-led government was entrenched in sugar politics with 13 of the 30 cabinet ministers owning or controlling sugar factories,” Parineeta Dandekar, associate coordinator of South Asian Network for Dams, Rivers and People, wrote in her analysis of the sugarcane situation in Maharashtra. There are five river basins in Maharashtra: Krishna, Godavari, Tapi, Narmada and a combined basin of westward flowing rivers in the coastal Konkan region. Of these, three are agriculturally important—Krishna, Godavari and Tapi. They cover 89% of the state’s area; 0.4% of the state falls under the Narmada river basin. The Konkan basin drains 10.9% of the land, while containing 55% of the state’s water. The Krishna basin drains most parts of Western Maharashtra, the prosperous districts of Kolhapur, Pune, Satara, Sangli and Solapur, and some perennially drought-plagued areas, such as eastern swathes of Sangli, Satara and Solapur districts. The Godavari basin covers the drought-hit regions of Marathwada and Vidarbha. Of the 125 billion cubic metres (BCM) surface water available in Maharashtra’s river basins, most of the 69 BCM in the Konkan region goes unutilised, according to this 2012 Maharashtra government White Paper on Irrigation. In contrast, the 17 BCM in the Krishna and 34 BCM in the Godavari basins are insufficient for the regions they water. “In Maharashtra, sugarcane cultivation, which is on (sic) less than 4% of the total cropped area of the state, takes away almost 70% of irrigation water in the state, leading to massive inequity in the use of water within the state,” said the sugarcane price policy report, 2014-15, issued by the Commission on Agricultural Costs and Prices (CACP). The CACP tabulates the share of irrigation water used by major crops in Maharashtra. Sugarcane is the only crop in Maharashtra which is wholly irrigated. Irrigation water is available for no more than 9% of pulses and 4% of oilseeds. About 10 million farmers grow jowar, pulses and oilseeds—no more than a tenth of these farms are irrigated, as we said—and these crops use about 2.2 million litres of water per hectare, about 2,000 MCM of water through the year. Sugarcane’s 1.1 million farmers use 18.7 million litres per hectare and consume 18,000 MCM—nine times that of jowar, oilseeds and pulses—annually across the state. Urban water consumption patterns are heavily tilted towards developed cities. The city of Latur in Marathwada consumes 60 litres per person daily, while an average Mumbaikar uses around 260 litres a day. The average daily use of water per person in Pune is 352 litres, according to IndiaSpend calculations, based on daily water requirements of these cities and the latest available population figures. A village with less than 20,000 people should get 40 litres of water per person per day, five litres less than the water prescribed to flush a toilet in a city such as Mumbai—these are the standards set in 1993 by the Bureau of Indian Standards in its Code of Basic Requirements. The standards also recommend reduced water supply to poorer localities in urban areas. In 2015, the Kelkar Committee on balanced regional development in Maharashtra recommended 140 litres per capita per day across rural and urban Maharashtra. The recommendation has not yet been included in the state’s water policy. Despite the issue being in the social media, why does this imbalance exists even after decades of various committees reports? Why is a PIL not filed to quash this impartial distribution? For the sake of 10 sugarcane owners, around 95 other farmers have to suffer every day. A good analysis. However, there are some points to be noted. With 16% of the population of the world and 6% of global freshwater resources, unequal geographical distribution is clearly the first cause. 82% of water is consumed by agriculture, 14% by industry & 4-5% for domestic use. The water consumption by agriculture is double that of China and more than double that of USA for equal quantities of crop produced. This suggests that the primary inefficiency in water usage is in agriculture, and not profligacy by domestic users, even in cities. Domestic consumption in India, per capita, is much les than in China, leave alone comparison with USA. Even if domestic usage was cut in half, it would barely make a difference to the water shortage. Hence, wastage in agriculture is the second cause. India gets four times its recharge requirements, unfortunately concentrated in four months. This would suggest requirement of efficient storage. Yet, water storage (per capita) in China is 11 times more than in India, and 20 times more in USA. So, inadequate water storage is the third cause. Improper & unbalanced distribution is, of course, the fourth cause. Several other points could be highlighted, but they would be too long. Interested readers can download a paper from http://ssrn.com/abstract=2782759 and visit http://expertstrat.com/forums/topic/perspective-on-water/. A chicken & egg situation: did the sugarcane come first or the irrigation canal? I say this, because even in Mandya district of Karnataka, farmers close to the canal prefer to grow sugarcane. It is almost as if the ease of availability of water is their birthright! Their protests every time the Supreme Court forces the Karnataka Govt to release water from the dam implies as much. Is the situation same in Uttar Pradesh? Perhaps not. Perennial rivers from Uttarakhand feed the rivers in UP, and the irrigation projects may not be too badly impacted. If available, author should check what was being grown in the area “before” the irrigation projects were implemented. The author may say that the current reality is the ONLY thing that matters; historical data does not. But this data should be available to those who we expect to influence the farmers to “change” their water usage patterns. Where does the 10% usage by 10m famers happen? I would not be surprised if this is at the fag end of the irrigation canals. Given a choice of more water, at least 9.9 m of those farmers would also move to cultivating sugarcane! What is the ratio of water needed to grow sugarcane vs. pulses? Or sugarcane vs jowar? Or sugarcane vs oilseeds? Is it 7:1? Irrigation projects are not a free market investment in India. Yet, the decisions of farmers, on how to use the water from such projects where available, and mostly free/highly subsidised, is a free market one. Water conservation efforts in agriculture will succeed best where there are no irrigation projects. For areas under irrigation projects, unless the quantum of water available for distribution is reduced in the upper reaches such that the lower reaches can get their share of water, the imbalance will continue unabated. This would be a large social and political challenge.